Some children are raised with a taught prejudice from their fathers. Some are taught to hate a race, or a religion or a gender. 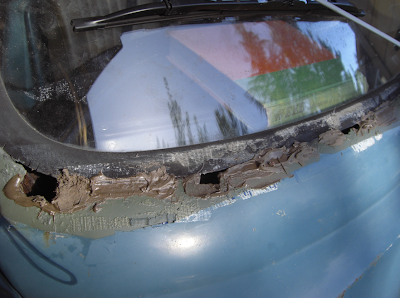 I was taught a deep and lasting hate for Bondo. 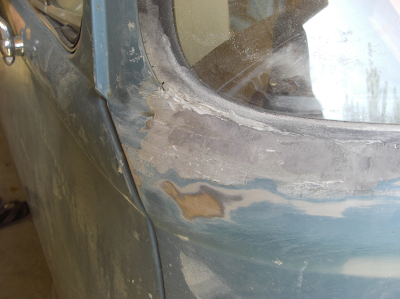 For those of you unfamiliar with Bondo, it is a rather sinister trick of the auto restoration business when used wrong. Its intention is to help with rust repair on cars. 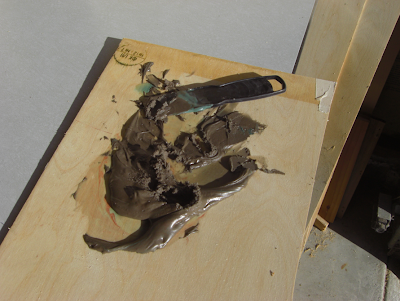 It is a paste-like substance that may be mistaken for a bomb-making material. You take that material, add what they call a "hardener" to it, and you have about 5 minutes to apply this paste to the area you want to fix. 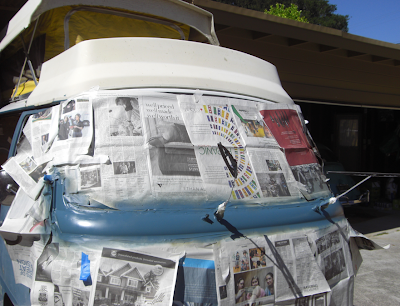 There are other prep steps, but that's the application of Bondo in nutshell (here's a video on the subject, if you are still looking for more info). My father hates Bondo. 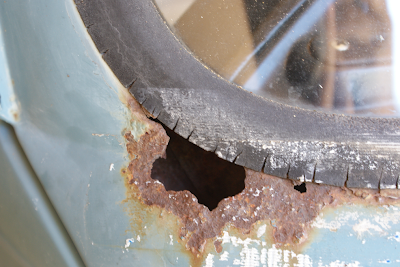 When used wrong, people use it to try to hide repairs made to rust (It can be detected by either someone doing a poor job, or sticking a magnet to the area in question). 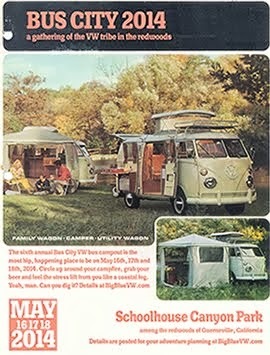 I have memories of car-hunting with my dad when I was young. I have clear visions of him looking over some beautiful car from the 1930s, while I stood breathlessly amazed at the possibility that we might own this car if it passes his test. And I wanted it to pass his test. But if we headed back to our car and he uttered the sentence, "It's all filled with Bondo", I knew it was a death sentence. To him, it was worse than rust. It was hidden rust! And the car deserved equal parts sympathy and disdain. 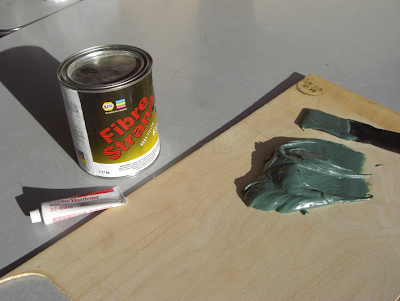 So you can imagine the mental leap I had to overcome a few weeks back when I found myself actually standing in the local auto parts store with a giant can of Bondo in my hand, actually considering the purchase. But, each generation rebels against the previous. 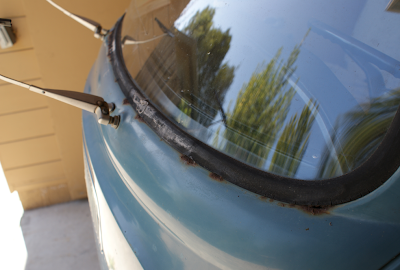 Besides, the winter rains are coming here in California and I had a giant rust hole under my windshield. 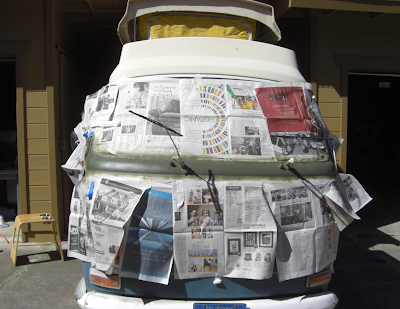 I started out looking for fiberglass, started reading the Bondo and then ended up going with "body filler", which is almost exactly like Bondo but it sounds a little more professional and I thought I could face my dad with a term like that. The guy at the counter was kind enough to walk me through all the steps to do the job, and after a Saturday and Sunday working on it off and on, it was done. Now, I have to say, it was easy. Super easy. But I did a lackluster job for sure. I'm looking at this as just a way to waterproof Big Blue for winter and I was scrambling to get this done before leaving on the Oregon trip as I was sure we would encounter rain there. Soon, I will have to face the fact that Big Blue needs to get into a body shop and get the new front end put on by professional (with metal, not Bondo). I'm sure to get it right takes a good deal of patience and some practice. Oh, and a lot of sanding. The area of concern. Did I say "hole"? I meant, "Holes". The largest offender. A little bigger and I could have used it for storage. The driver's side is not nearly as bad. 2. Prep the area with a few coats of rust-prevention spray. Allow for drying time. 3. 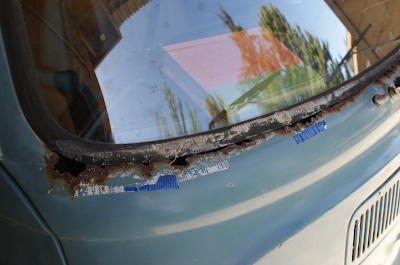 Apply the Bondo... um, body filler ... to the area in question. I used a plastic putty knife. 4. Move quick. It dried on me very fast the first batch. 6. 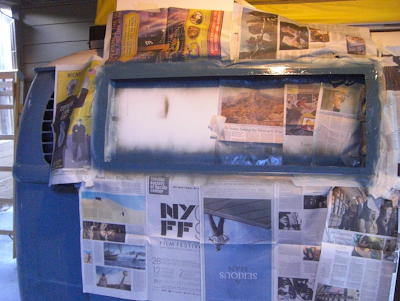 I sanded the primer with a really light sandpaper. Like 1500 or something like that. And then you paint what is hopefully a color close to the color of the rest of your car. In my case, the color is off, but not too far to be bad. 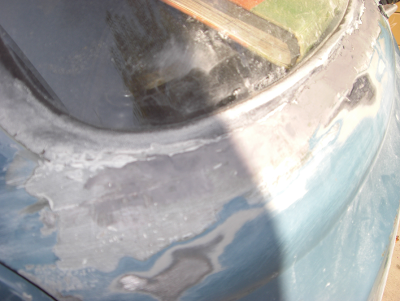 Prep the area with a few coats of rust-prevention spray. Allow for drying time. 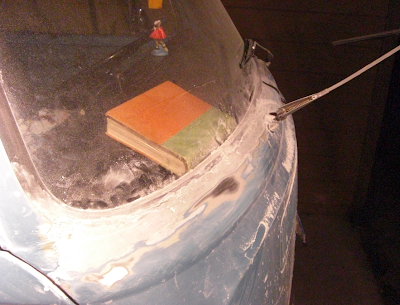 Apply the Bondo... um, body filler ... to the area in question. I used a plastic putty knife. This stuff dries super fast. This is about 5 minutes after mixing it. Rock hard. 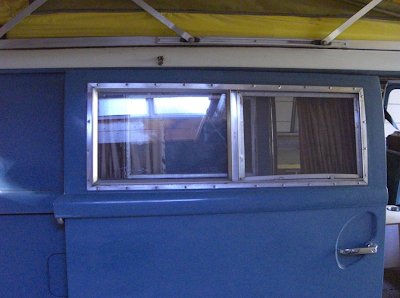 While doing so rust prevention, I took off the side window I had worked on before to seal it better. EP had told me that it leaked with on the Bettys and Buses Trip. 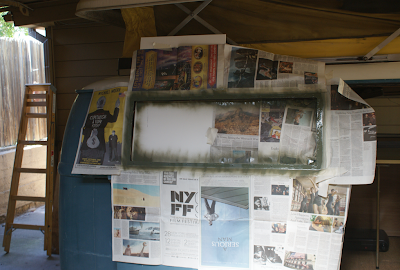 While it was off, I took the opportunity to hit the insides of the door (you have access to inside the door with the window out) with the rust-prevention spray, and then sanded, primed and painted the area that was under the window frame. In all, it came out really well. 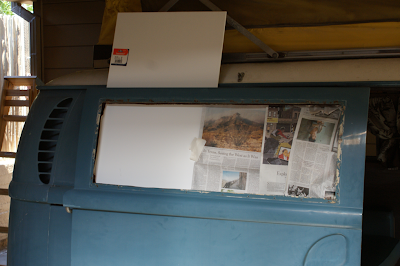 And then I put down a fresh seal of caulk and then put the window back in. 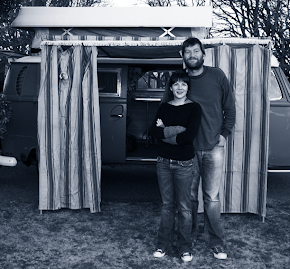 It must have worked as the window stayed dry in the heavy rains we would have the first night in Oregon. 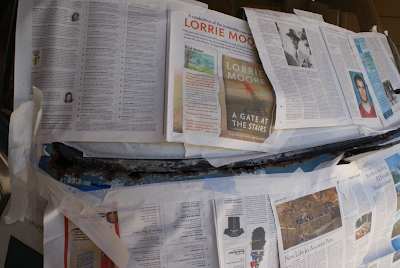 The picture on the 2nd day with Big Blue in the sunlight and newspaper plastered all around the work area reminds me of a woman at a hairdresser with foil layers all in her hair for highlights. Made me laugh. I don't think it was appreciated. Nice looking work, Brett. Remember that we can call our former neighbor Troy in Frederick if you need to go any deeper. That was his business - Sealutions -remember? 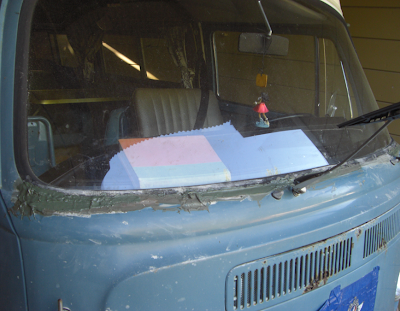 good job on the bondo...my bus has the same holes. i was able to score some doner metal and a buddy with mad welding skills, and we are going to fix it in the new year. CW - We have the same plan. Bought another front end a while back and hope to do a real swap at some point soon.